The European energy industry met at E-world in Essen from 05 to 07 February 2019. 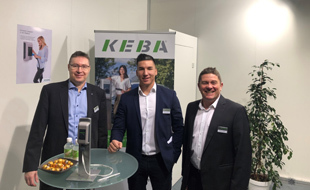 In the "Smart Energy" area, which illustrates the importance of intelligent and efficient products, solutions and technologies, KEBA was represented with its own stand and was able to enthuse not only numerous customers but also an international delegation. KEBA's appearance at the trade fair focused on the advantages of a wallbox that conforms to calibration law. It can thus be integrated into any backend for the billing process, whereby the charging station remains updateable for future features. Since no additional hardware components have to be installed in the KEBA wall boxes to ensure conformity with calibration law, they also offer an optimum price/performance ratio. The topic of MID certification and conformity with calibration laws met with enormous interest and many visitors took advantage of the opportunity for intensive exchange with KEBA's experts. In addition to numerous customers and interested parties, a delegation of ambassadors and consuls visited the KEBA stand. 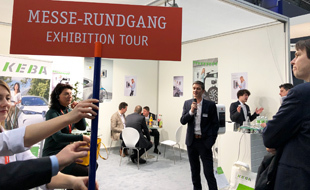 During the 15-minute presentation, the international guests were able to gain an overview of KEBA and its visions on the subject of "Digitization in Electric Mobility".